From the Department of Family Medicine, Medical College of Georgia, Georgia Regents University, Augusta. Upper gastrointestinal bleeding is an uncommon but potentially serious, life-threatening condition in children. Rapid assessment, stabilization, and resuscitation should precede all diagnostic modalities in unstable children. The diagnostic approach includes history, examination, laboratory evaluation, endoscopic procedures, and imaging studies. The clinician needs to determine carefully whether any blood or possible blood reported by a child or adult represents true upper gastrointestinal bleeding because most children with true upper gastrointestinal bleeding require admission to a pediatric intensive care unit. After the diagnosis is established, the physician should start a proton pump inhibitor or histamine 2 receptor antagonist in children with upper gastrointestinal bleeding. Consideration should also be given to the initiation of vasoactive drugs in all children in whom variceal bleeding is suspected. An endoscopy should be performed once the child is hemodynamically stable. PubMed was searched in Clinical Queries using the key search terms children or infants, gastrointestinal bleeding, and gastrointestinal hemorrhage, pathogenesis, diagnosis, and treatment. The search included meta-analyses, randomized controlled trials, clinical trials, and reviews. We also searched Clinical Evidence, the Cochrane database, Essential Evidence Plus, the National Center for Biotechnology Information at the US National Library of Medicine, the National Guideline Clearinghouse, and DynaMed. Our initial search date was November 5, 2012, with follow-up searches preformed in December 2012, May 2013, and February 2014. The causes of UGIB can be categorized by age groups. In newborns the predominant causes include coagulation disorders such as vitamin K deficiency, cow milk intolerance, gastritis from stress, sepsis, and trauma from the placement of nasogastric tubes.10 From 1 month to 1 year of age, the most prevalent causes are caustic ingestions, duplication cysts, foreign body ingestion, stress esophagitis, medication-induced bleeding (eg, nonsteroidal anti-inflammatory drug [NSAID] use), and peptic ulcer bleeding.10 From 1 to 5 years of age, causes include erosive esophagitis, gastritis, caustic ingestions, peptic ulcer bleeding, varices, and vomiting-induced bleeding, for example, from a Mallory-Weiss tear.10 From ages 5 to 18 years, bleeding can arise from coagulation disorders, gastritis, Dieulafoy lesions (an anomalous artery located in the digestive tract), erosive esophagitis, peptic ulcer disease, caustic ingestions, and vomiting-induced bleeding.10 Crohn's disease is an uncommon cause of UGIB in children and adolescents.11,12 Certain foods may create confusion for children and parents by mimicking the appearance of blood in vomitus (eg, red food coloring, fruit-flavored drinks, fruit juices, and beets) or by mimicking the appearance of melena in stools (eg, iron, grape juice, spinach, or blueberries).11,12 All suspicious findings consistent with blood should be investigated further. There are no randomized controlled trials, Cochrane reviews, or systematic reviews of the diagnostic approach in children with UGIB. The diagnostic approach is mostly extrapolated from studies of adults; the key points are an extensive history and examination, laboratory evaluations, and diagnostic procedures. 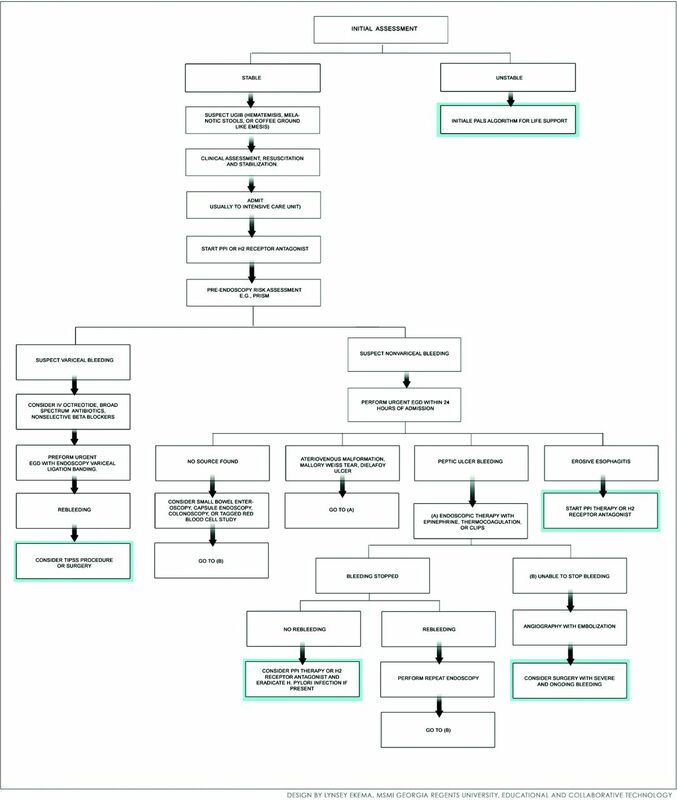 Algorithm for the approach to treating a child with upper gastrointestinal bleeding. EGD, esophagogastroduodenoscopy; H2, histamine 2; IV, intravenous; PALS, pediatric advanced life support; PPI, proton pump inhibitor; PRISM, pediatric physiology-based score for mortality. Blood transfusion is appropriate for unstable patients and those with hemoglobin ≤8 g/dL.8 The amount of blood transfused should be determined according to age and weight.8 Children with active bleeding and coagulopathy should be considered for transfusion with fresh frozen plasma; those with thrombocytopenia should also be considered for platelet replacement, particularly when platelet count is <30,000.8 Considering starting a proton pump inhibitor, for example, omeprazole, in all children with UGIB is reasonable.8,24 Vasoactive drugs (eg, octreotide or vasopressin, broad-spectrum antibiotics, and nonselective β-blockers) can be added in children who are suspected of having variceal bleeding8 (Tables 8 and 9). Octreotide is preferred over vasopressin because it has improved efficacy and fewer side effects.34 Cytoprotective agents such as sucralfate and misoprostol have no role in the treatment of clinically significant UGIB in children. A multidisciplinary team in a tertiary care center may be necessary to evaluate and manage children with UGIB. Consultation with pediatric intensivists, gastroenterologists, anesthesiologists, and surgeons may be required for patients with life-threatening bleeding.3 Endoscopic treatments include the application of clips, coagulation, banding, injection, sclerotherapy, and the use of tissue adhesives.8 A pediatric interventional radiologist or other specialist is needed if angiography is indicated when endoscopic therapy is unsuccessful.34 Children with bleeding that is not controlled with endoscopic or angiographic interventions should be evaluated for surgery34 (Figure 1). Received for publication May 15, 2014. Accepted for publication October 14, 2014.
. Upper gastrointestinal bleeding in children: an 11-year retrospective endoscopic investigation. World J Pediatr 2012;8:123–8.
. Duodenal ulcers dominate acute upper gastrointestinal tract bleeding in childhood: a 10-year experience from Hong Kong. J Dig Dis 2008;9:199–203.
. Gastrointestinal bleeding in infants and children. Pediatr Rev 2008;29:39–52.
. Upper gastrointestinal bleeding in children and adolescents. Pediatrics 1979;63:408–13.
. Prevalence of, and risk factors for, upper gastrointestinal tract bleeding in critically ill pediatric patients. Crit Care Med 1992;20:1519–23.
. The impact of clinically significant upper gastrointestinal bleeding acquired in a pediatric intensive care unit. Pediatr Crit Care Med 2001;2:294–8.
. Clinical features and risk factors for upper gastrointestinal bleeding in children: a case-crossover study. Eur J Clin Pharmacol 2010;66:831–7.
. Upper gastrointestinal tract bleeding management: Belgian guidelines for adults and children. Acta Gastroenterol Belg 2011;74:45–66.
. Frequency of upper gastrointestinal bleeding in a pediatric intensive care unit. Crit Care Med 1992;20:35–42.
. Upper gastrointestinal hemorrhage. Pediatr Rev 1999;20:171–4.
. Diagnosis and management of upper gastrointestinal bleeding. Am Fam Physician 2012;85:469–76.
. Upper gastrointestinal bleeding in children. Clin Pediatr (Phila) 2007;46:16–21.
. An assessment of the safety of pediatric ibuprofen. A practitioner-based randomized clinical trial. JAMA 1995;273:929–33.
. The effect of non-steroidal anti-inflammatory drugs and Helicobacter pylori infection on the gastric mucosa in children with upper gastrointestinal bleeding. Pediatr Surg Int 2010;26:227–30.
. Upper gastrointestinal bleedings in patients with hereditary coagulation disorders in northwest of Iran: prevalence of Helicobacter pylori infection. Eur J Gastroenterol Hepatol 2011;23:1172–7. ; Practice Parameters Committee of the American College of Gastroenterology. American College of Gastroenterology guideline on the management of Helicobacter pylori infection. Am J Gastroenterol 2007;102:1808–25.
. The patient with scoliosis. The defect: classification and detection. Am J Nurs 1979;79:1588–91.
. 13C-Urea breath test for the diagnosis of Helicobacter pylori infection. Eur Rev Med Pharmacol Sci 2013;17(Suppl 2):51–8.
. Accuracy of Helicobacter pylori stool antigen for the detection of Helicobacter pylori infection in dyspeptic patients. World J Gastroenterol 2005;11:386–8.
. Incidence and risk factors of upper gastrointestinal bleeding in mechanically ventilated children. Pediatr Crit Care Med 2009;10:91–5.
. Prophylactic sclerotherapy in children with esophageal varices: long-term results of a controlled prospective randomized trial. J Pediatr Surg 2000;35:401–5.
. Prognostic value of endoscopy in children with biliary atresia at risk for early development of varices and bleeding. Gastroenterology 2010;139:1952–60.
. Effectiveness of beta blockers in primary prophylaxis of variceal bleeding in children with portal hypertension. Trop Gastroenterol 2011;32:299–303.
. Stress ulcer prophylaxis in pediatric intensive care units. J Pediatr (Rio J) 2010;86:525–30.
. Upper gastrointestinal bleeding. Indian J Pediatr 2011;78:227–33.
. Gastrointestinal bleeding in children following ingestion of low-dose ibuprofen. J Pediatr Gastroenterol Nutr 2007;44:506–8.
. Selective serotonin reuptake inhibitors and risk of upper GI bleeding: confusion or confounding? Am J Med 2006;119:719–27.
. Dexamethasone treatment during ventilator dependency: possible life threatening gastrointestinal complications. Arch Dis Child 1992;67(1 Spec No):10–1.
. Haemoglobin in stools from neonates: measurement by a modified Apt-test. Med Lab Sci 1991;48:346–7.
. BUN/Cr ratio as an index of gastrointestinal bleeding mass in children. J Pediatr Gastroenterol Nutr 1992;15:89–92.
. Detection of occult blood in gastric juice. J Clin Gastroenterol 1984;6:119–21.
. Incidence of occult upper gastrointestinal bleeding in patients presenting to the ED with hematochezia. Am J Emerg Med 2007;25:340–4.
. Angiography in gastrointestinal bleeding in children. AJR Am J Roentgenol 1984;143:837–40.
. Gastrointestinal bleeding in infancy and childhood. Gastroenterol Clin North Am 2000;29:37–66, v.
. PRISM III: an updated Pediatric Risk of Mortality score. Crit Care Med 1996;24:743–52.
. Clinically significant upper gastrointestinal bleeding acquired in a pediatric intensive care unit: a prospective study. Pediatrics 1998;102(4 Pt 1):933–8.
. Frequency and prophylaxis of upper gastrointestinal hemorrhage in critically ill children: a prospective study comparing the efficacy of almagate, ranitidine, and sucralfate. The Gastrointestinal Hemorrhage Study Group. Crit Care Med 1992;20:1082–9.
. Somatostatin analogues for acute bleeding oesophageal varices. Cochrane Database Syst Rev 2008;(3):CD000193.
. Octreotide therapy for control of acute gastrointestinal bleeding in children. J Pediatr Gastroenterol Nutr 2004;38:41–7.
. Meta-analysis: Combination endoscopic and drug therapy to prevent variceal rebleeding in cirrhosis. Ann Intern Med 2008;149:109–22.
. Management of esophageal varices in children by endoscopic variceal ligation. J Pediatr Surg 1996;31:1056–9.
. Endoscopic cyanoacrylate injection versus beta-blocker for secondary prophylaxis of gastric variceal bleed: a randomised controlled trial. Gut 2010;59:729–35.
. Transjugular intrahepatic portosystemic shunts in children with biliary atresia. Cardiovasc Intervent Radiol 2002;25:484–93.
. Effectiveness of Rex shunt in children with portal hypertension following liver transplantation or with primary portal hypertension. Pediatr Transplant 2009;13:540–4.
. Surgery for peptic ulcer disease in children in the post-histamine2-blocker era. J Pediatr Surg 2005;40:850–4.